These forms are important for knowing about a property/land in relation to residential and official work. Every detail about the property is required for the person interested. Information like land area, environmental concerns, profitability is seen. Investors, loan givers are generally interested in such forms for commercial purposes like for building shopping malls, cinema halls etc. The form is used for all the review of information about real estate properties. A contract is signed to meet the minimum standards, so that no further issues are created regarding real estate. Every employee is analyzed in a professional setup. They are judged and reviewed time and again. This form helps in knowing a worker and his/her habits. Information like work habits, punctuality, productivity, technical skills, attitude creativity, communication skills, enthusiasm, dependability and many more are assessed by higher bodies. An overall rating is done with spaces for comments for improvement and reviews. This is a desktop review of properties that a borrower is interested in. This form has information about properties between 2 or more of them. A reviewer views the pros and cons of the property which can be used for residential purpose, pub, multifamily etc. The form is divided into Sales Comparison Approach and Relative Comparison Analysis. It is compared with location, area, facilities nearby etc. 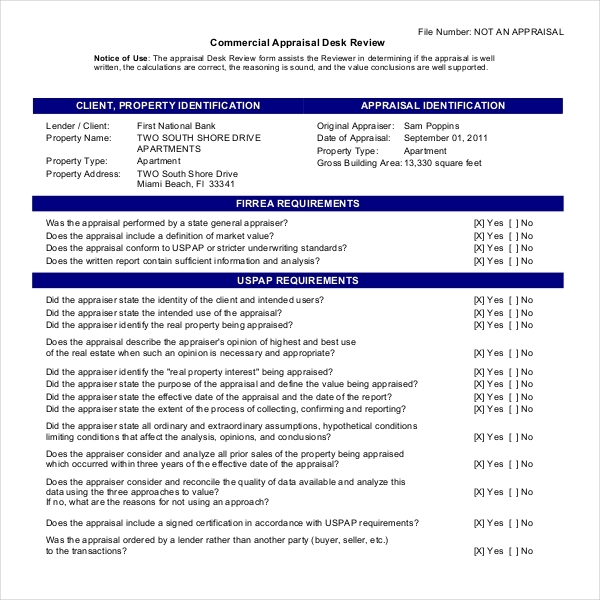 Freddie mac appraisal review form is used to give a client or lender with an opinion or view on the correctness of the assessment report under review. Apart from the basic information about the client, the borrower and the land details, the form concerns about all the information provided in the past, are accurate or not. This form is to know the accuracy about all the data given. A verification of the data takes place with the reason for the opinion given. 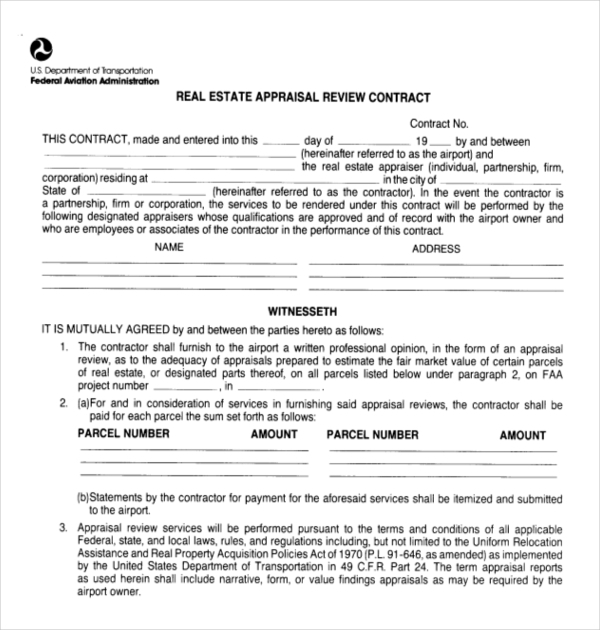 If the reasons are not accurate, the appraiser reviewer is required to explain what is missing. 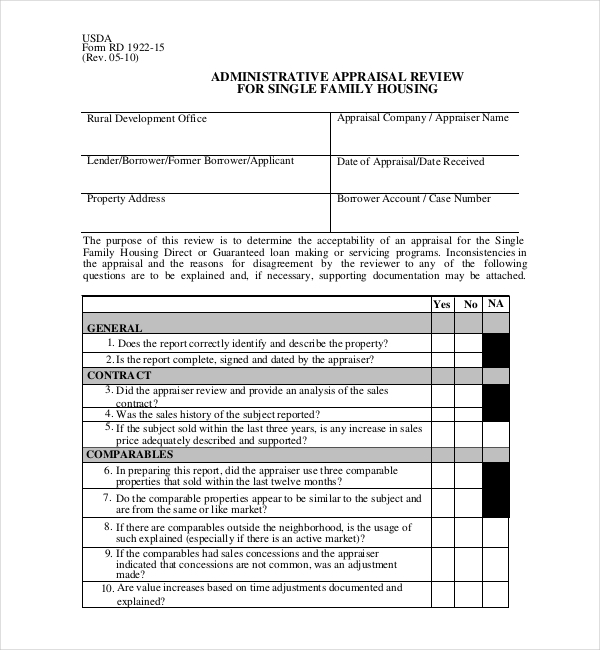 This form is basically for quality assurance for the client/lender relating to the property. Detailed guidelines for completing the report, certification, statement of limiting conditions are included in the form. Reviewer appraiser, client, original client details are to be filled accurately. The reviewer looks in to the analysis of the property given in the appraisal report for loan purposes. This consists of reports about consistency, accuracy and analysis of the property in question. This form is used to check whether all the details given previously are correct or not. 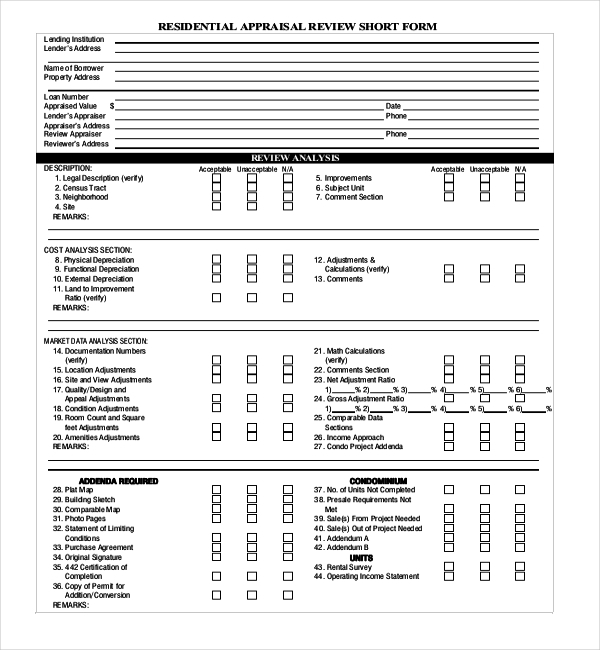 This form is used for residential purposes. It requires the information of the lender/borrower and the reviewer with all the details about the house. Information about the house like description of rooms, cost analysis, market data analysis, reviewer’s summary and supplementary data is filled in accordingly. A large section for reviewer’s comments is given to fill extra details as suitable. 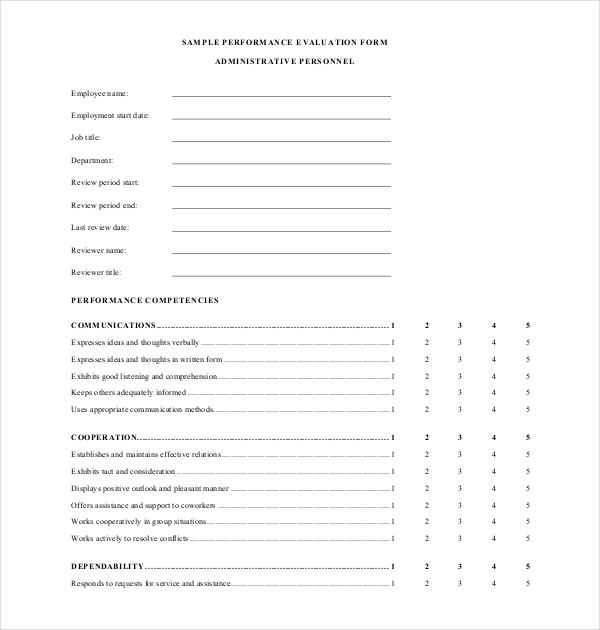 This self-appraisal review form is for the employees own competencies and weaknesses. The employee is reflecting their own view, themselves. They are evaluating themselves through this form about their abilities and other aspects that are considered in a workplace. Communication, dependability, cooperation, initiative, judgment, job knowledge and many more are filled up here. The reviewer then assesses this form based on the employee’s and his own perspective. This form is for accepting the assessment for single family housing direct or service programs or guaranteed loan making. No inconsistencies in the information are tolerable here. Information regarding the property, previous contracts, information about comparable properties and other information is filled up here. It is upon the reviewer to accept the report after the analysis. Favorable reasons must be given if not accepted. Appraisal reviews are very important in any field nowadays. It is a crucial step for loan and investment purposes of any kind. A proper appraisal reviewer looks into every small detail of the appraisal report and decides on the declaration of further process. Reviews of employees, properties, self-review, residential review is mandatory for certain verifications. This step is considered for legal verifications, noting for any suspicious move, document checking etc. An appraisal review form gives clarity to the person who will use the final report for a particular decision, like giving loans for the property. It is highly recommended for those who are looking for property for commercial, residential, real estate purposes. It is also recommended for analyzing your employee and group workers in relation to the company they work in. The appraisal forms are read through properly and verified for authenticity. The appraisal forms are important documents that are used for vital decisions. 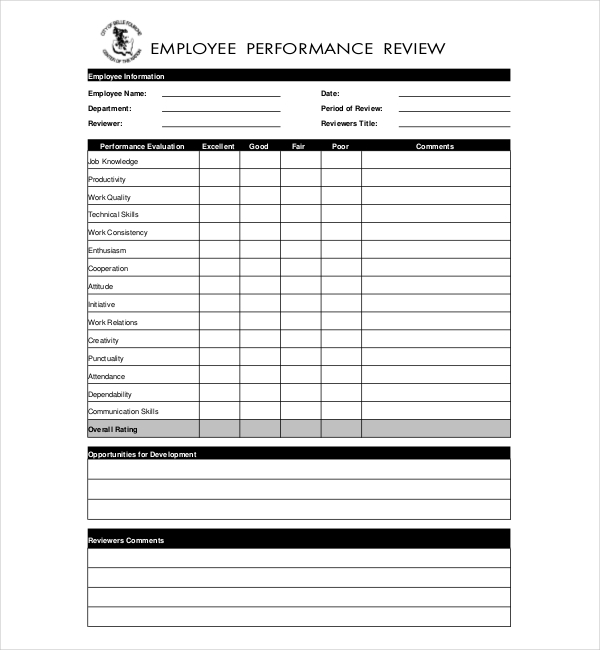 Apart from the reviewer themselves, this form can be used for company’s benefit by the head of the company, in relation to employee’s appraisal review. It can be used by legal bodies like courts as a form of proof regarding property issues. Bank officials who are in-charge of sanctioning loans for properties use this form as a guarantee that it is safe to lend money to the person/group concerned. 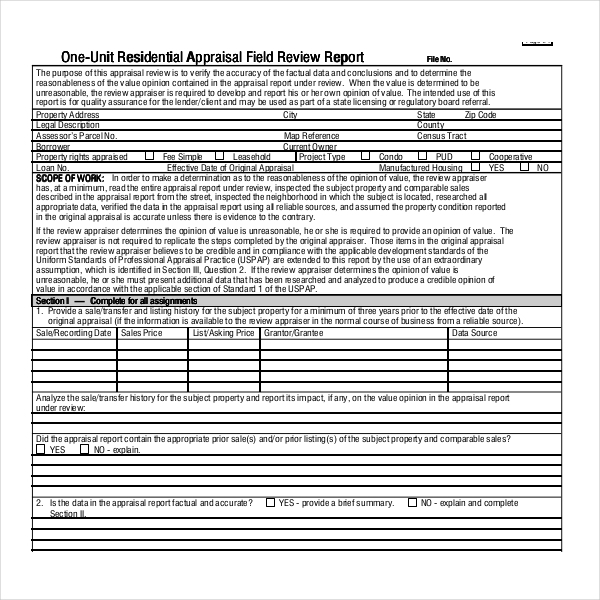 There are many details that go inside an appraisal review form. The information of the buyer/client, lender, reviewer and all the minute details of the land is added in this form. Land details like the area, purpose of use, comparable properties looked into, neighborhood details, standards and many more are filled in. For the employee appraisal, details of the reviewer and the employee are filled in along with the quality analysis, habits, punctuality, initiation and other information. For residential appraisal and single family appraisal, details of the family, land, use of the land, house description along with details of comparable land is filled in. A self-appraisal review is for the employee him/herself in the company. It is for the employee to judge themselves regarding their competencies and weaknesses in the company. Appraisal reports should be studied in a careful and unbiased way. The reviewer must not have any previous notions and take steps accordingly. The reviewer must have an independent mind so that it doesn’t affect the decision. Any bias of any sort, regarding the review, can land the reviewer into huge consequences. A copy of the form can be done to be in a safer side. A reviewer can clarify a doubt in any place needed. He/she has the full authority to cancel the appraisal report considering he/she gives valid reasons for it. Having a question about how to get these forms? You need not worry. Gone are the days when you had to buy these forms manually and then start the work. 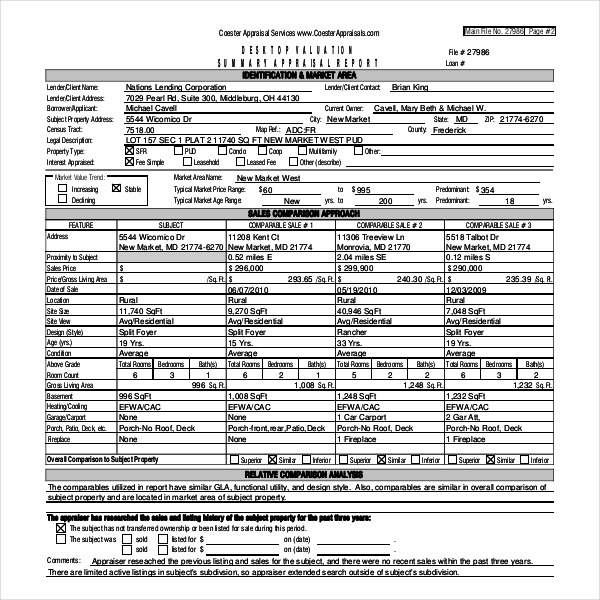 These forms are now easily available online. You are just one click away to download the forms and print them. We have all the versions of these forms. But if you still feel like customizing them according to your own needs, we would be happy to do so. Have no doubt about the errors in these forms as we guarantee you error-free ones. Be assured about the success rate of these forms. They are quite high. 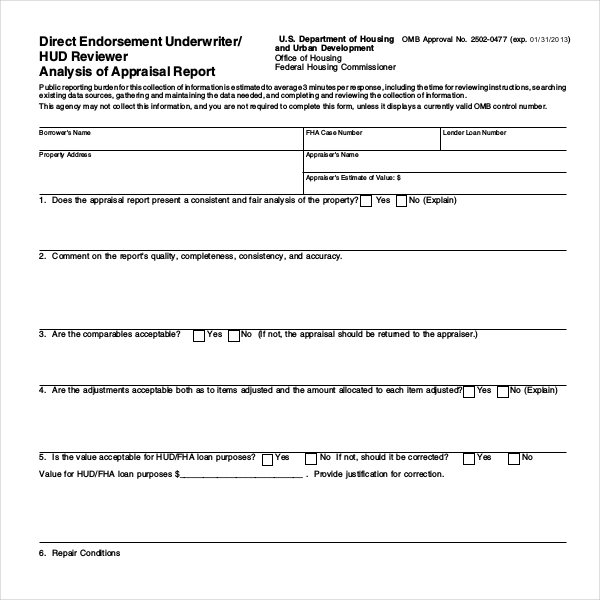 The appraisal review forms come in Word and PDF format as well. These forms are highly reliable and have the perfect rating scales that one needs. The forms come in higher and lower compatible versions as well. 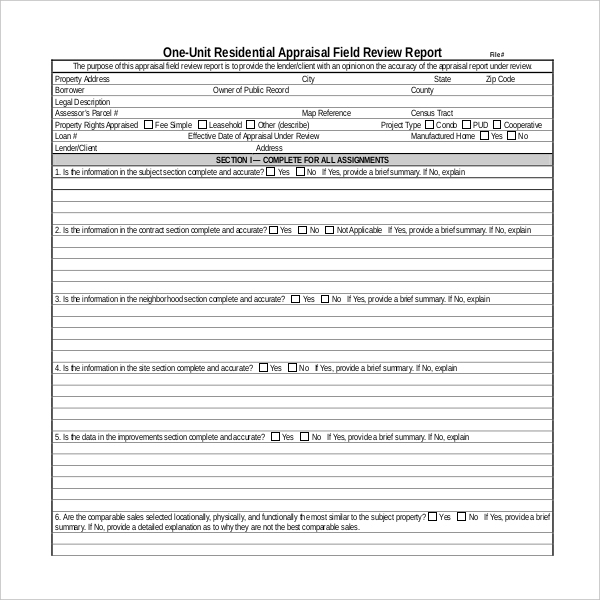 Appraisal review forms are important in every field today. There is a need to know a person/land thoroughly so that further measures are taken to improve or strategize on it. Appraisal reviews are sometimes skipped because of many reasons like cost, time etc. However it is advisable that this process be done for avoiding counterfeit acts of any sort.